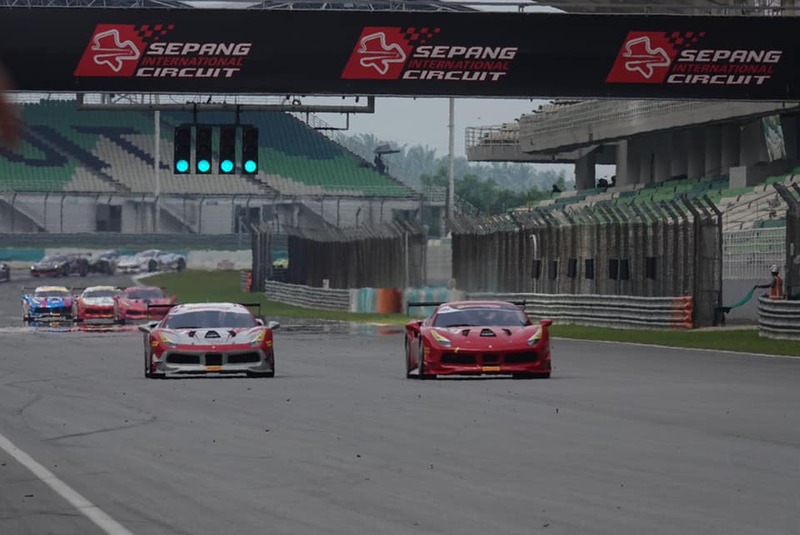 EMS Race Team driver, James Weiland, celebrated his birthday at the Sepang International Circuit in Malaysia during Ferrari Challenge weekend. But instead of cake and ice cream, it was all trophies and podiums for Weiland and his crew from Boardwalk Ferrari/Ferrari of San Francisco. During Race 1, Weiland and his ems+ Ferrari 488 Challenge trimmed in red, PARIS, came from the fourth position out of 22 drivers to secure P3 and the podium. PARIS would follow that up in Race 2 by qualifying less than .04 of a second off pole before finishing P2 to conclude the weekend. When the racing action began on Saturday, Weiland lost two positions at the start of Race 1 and was forced to settle into sixth. From there, however, he and PARIS picked off one car at the end of the first lap for fifth position. They then got the guy just ahead for fourth a few laps later. On the final lap and second-to-last corner, Weiland managed to get inside in traffic and secure third place before crossing the finish line. In Race 2 on Sunday, PARIS got snagged again at the start by being on the outside. EMS would still gain a slight lead into the first corner before coming out of the second corner in third. Then, Weiland and PARIS picked up one position while driving a technically sound race to earn their second-straight trip to the podium in Malaysia. People for the Ethical Treatment of Animals (PETA) is the largest animal rights organization in the world, with more than three million members and supporters. Products proudly displaying the bunny logo are cruelty-free, meaning that they were produced without testing on animals. Coach Sam’s Inner Circle Foundation’s mission is to provide educational support to at risk children through a combination of literacy, personal development and health and fitness programs designed to develop the whole child. Cornerstone of Hope, meanwhile, is dedicated to providing support, education, and hope for the grieving. Each mission was featured on Weiland’s car throughout the trip to Malaysia. Next up for EMS Race Team is the Ferrari Challenge at Red Bull Ring in Spielburg, Austria on May 3-5. For more behind-the-scenes coverage of race weekend at Sepang follow EMS Race Team on Facebook, Twitter and Instagram. 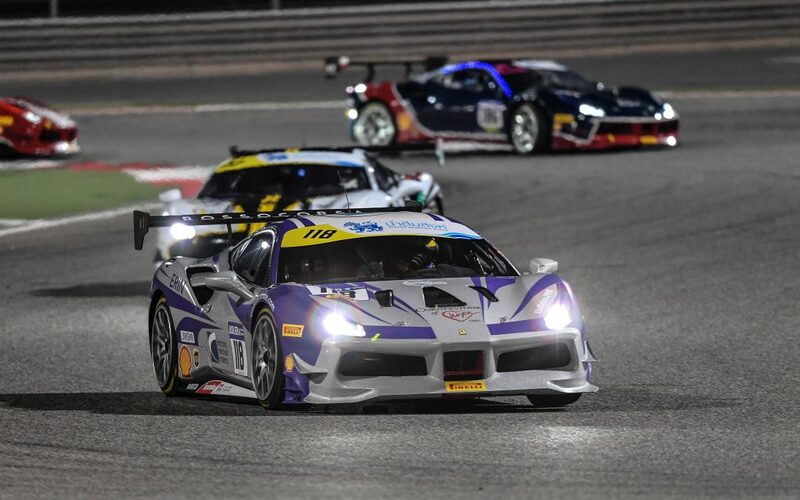 After earning a podium finish in Australia for the second-straight year, EMS Race Team will now travel to Malaysia for the Ferrari Challenge at the Sepang International Circuit on April 19-21. This will mark the first time that driver James Weiland and the crew from Ferrari of San Francisco will compete at a Ferrari Challenge event in Malaysia. It will also mark the fourth racing event of the 2019 season for EMS following stops in Bahrain, Texas and Australia. EMS Race Team will enter the weekend at Sepang with the goal of raising awareness for PETA Cruelty Free, Coach Sam’s Inner Circle Foundation and Cornerstone of Hope. In Malaysia, Weiland will be racing PARIS the ems+ Ferrari 488 Challenge trimmed in red on a track that they tested at earlier this year. The circuit is located in Sepang, Selangor, Malaysia which is approximately 28 miles south of Kuala Lumpur. Sepang officially opened for racing in March of 1999 and went on to host the Formula One Malaysian Grand Prix from 1999-2017. With a length of 5.543 km, the circuit features 15 turns and 8 straights along with ample opportunities for overtaking. Once again on the international stage, EMS Race Team will do their best to help promote the efforts of the three causes they hold dear to their hearts. People for the Ethical Treatment of Animals (PETA) is the largest animal rights organization in the world, with more than three million members and supporters. Products proudly displaying the bunny logo are cruelty-free, meaning that they were produced without testing on animals. Coach Sam’s Inner Circle Foundation’s mission is to provide educational support to at risk children through a combination of literacy, personal development and health and fitness programs designed to develop the whole child. Cornerstone of Hope, meanwhile, is dedicated to providing support, education, and hope for the grieving. Each mission will be featured on Weiland’s car throughout the trip to Sepang. For more behind the scenes coverage of the Ferrari Races in Malaysia, follow EMS Race Team on Facebook, Twitter, and Instagram. 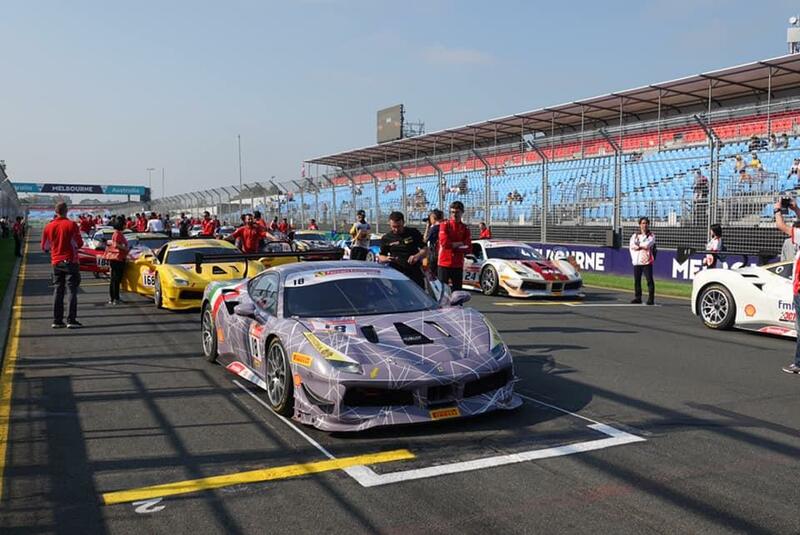 EMS Race Team competed in the Melbourne, Australia Ferrari Challenge and secured a podium finish in the land down under for the second-straight year. But while the third racing event of the season ended on a positive note, it certainly wasn’t easy. At the conclusion of Practice 2, the cockpit of PARIS the ems+ Ferrari 488 Challenge filled up with smoke. The fire team extinguished the flames in the engine compartment before finding the top half of the engine melted. The Boardwalk Ferrari / Ferrari of San Francisco team remarkably got a backup car ready in less than two hours for Qualifying 1 which driver James Weiland would then race for the duration of the event. Despite going on to qualify second for the first race of the weekend, EMS was assessed a five-place grid penalty for switching cars and started in seventh position as a result on Saturday. Weiland would pick off five cars at the start of Race 1—eventually passing the leader following a restart—before the upper arm broke just prior to the white flag forcing EMS to retire from the overall lead with a broken left front suspension. On Sunday, however, things would finally begin to break Weiland’s way. Starting in third position, EMS Race Team snagged second at the start of the race and held on from there to finish on the podium in P2. A packed house of racing fans were on hand as Weiland and company helped get PETA Cruelty Free, Coach Sam’s Inner Circle and Cornerstone of Hope up onto the podium in Melbourne once again. With the Ferrari Challenge serving as a support race to F1 weekend, there was an added excitement throughout the event. Those fans would go on to watch Mercedes driver Valtteri Bottas win the Rolex Australian Grand Prix 2019 by 20.886 seconds. People for the Ethical Treatment of Animals (PETA) is the largest animal rights organization in the world, with more than three million members and supporters. Products proudly displaying the bunny logo are cruelty-free, meaning that they were produced without testing on animals. Coach Sam’s Inner Circle Foundation’s mission is to provide educational support to at risk children through a combination of literacy, personal development and health and fitness programs designed to develop the whole child. Cornerstone of Hope, meanwhile, is dedicated to providing support, education, and hope for the grieving. For more behind-the-scenes coverage of Ferrari Challenge action, follow EMS Race Team on Facebook, Twitter, and Instagram. EMS Race Team will return to Australia for the second-straight year to compete at the Melbourne Ferrari Challenge on March 15-17. Following races at Circuit of the Americas last weekend—and the Bahrain International Circuit to open the season in February—driver James Weiland and the crew from Ferrari San Francisco will now race the Melbourne Grand Prix Circuit to raise awareness for PETA Cruelty Free, Coach Sam’s Inner Circle Foundation and Cornerstone of Hope. In Melbourne, Weiland will be racing PARIS the ems+ Ferrari 488 Challenge trimmed in red during a Ferrari Challenge event that will serve as a support race to the Formula One Grand Prix. The Melbourne Grand Prix Circuit is a street course that loops around Albert Park Lake just south of central Melbourne. In addition to annually hosting the Formula One Grand Prix, the Melbourne track also plays host to the Supercars Championship. The great Ferrari F1 driver Michael Schumacher owns the outright lap record in Melbourne with a mark of 1:24.125 set in 2004. The venue has reported upwards of 300,000 fans in attendance throughout F1 weekend during past years and a tremendous turnout is expected once again. The last time EMS Race Team competed on the world-famous track in Australia during F1 weekend Weiland nearly captured two podiums, finishing P2 and P4 out of 27 drivers. After qualifying P3 for Race 1 at COTA, EMS Race Team finished just off the podium in fourth position before a P9 in Race 2 in the Trofeo Pirelli class. This followed a Ferrari Challenge victory at Bahrain to start the season. That earlier experience is what Weiland and company hope to replicate as they travel around the world to represent three causes that are close to their hearts. People for the Ethical Treatment of Animals (PETA) is the largest animal rights organization in the world, with more than three million members and supporters. Products proudly displaying the bunny logo are cruelty-free, meaning that they were produced without testing on animals. Coach Sam’s Inner Circle Foundation’s mission is to provide educational support to at risk children through a combination of literacy, personal development and health and fitness programs designed to develop the whole child. Cornerstone of Hope, meanwhile, is dedicated to providing support, education, and hope for the grieving. Each mission is represented on EMS Race Team’s car, PARIS, and will be on display throughout F1 weekend in Melbourne. For more behind the scenes Ferrari Challenge racing action, follow EMS Race Team on Facebook, Twitter, and Instagram. There’s a certain magic that ERIN and PARIS the Electronic Merchant Systems Ferrari 488 Challenges provide out on the racetrack. It’s a magic that can’t necessarily be measured by horsepower or seconds but you know it when you see it. 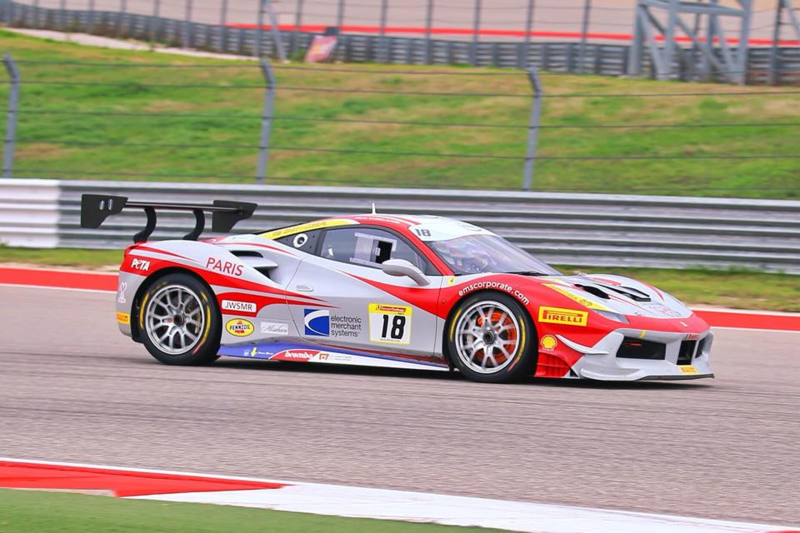 This weekend, while competing at the Circuit of the Americas Ferrari Challenge in Austin, Texas, driver James Weiland was forced to race without those valuable members of the EMS Race Team fleet. The loaner car that was graciously provided by a friend and teammate was fully optimized by the crew from Boardwalk Ferrari / Ferrari of San Francisco—and Weiland is not one to ever make it excuses. But it just wasn’t the same without the familiar roar from the EMS machines. On Saturday, Weiland qualified 3rd for Race 1 and was only a tenth away from 2nd. Unfortunately, he got passed a couple laps in before holding off the rest of the way to finish just off the podium in P4 among the always grueling Trofeo Pirelli class. On Sunday, qualifying didn’t go as well as the team hoped and they entered Race 2 in 9th position. Weiland would drive a clean race from there but finish P9 for the day. Despite the disappointing weekend, the attention quickly turned to Melbourne, Australia where the team will race later this week. In Austin, EMS Race Team took another opportunity to help raise awareness for PETA Cruelty Free, Coach Sam’s Inner Circle Foundation and Cornerstone of Hope. For those who watched the live broadcast of the races at COTA, the Ferrari announcers spent time talking about those causes that EMS races for which definitely helped spread that awareness. People for the Ethical Treatment of Animals (PETA) is one of those missions. They are the largest animal rights organization in the world, with more than three million members and supporters. Products proudly displaying the bunny logo are cruelty-free, meaning that they were produced without testing on animals. Coach Sam’s Inner Circle Foundation is another, whose mission is to provide educational support to at risk children through a combination of literacy, personal development and health and fitness programs designed to develop the whole child. Cornerstone of Hope, meanwhile, is dedicated to providing support, education, and hope for the grieving. For more behind the scenes racing coverage, follow EMS Race Team on Facebook, Twitter and Instagram. Stay tuned for more news later this week as we preview the Ferrari Challenge action in Australia. 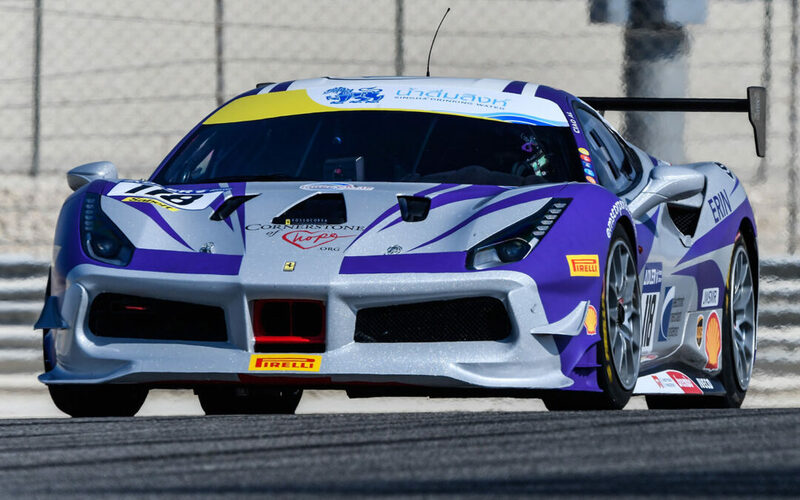 Following a victory in the Middle East at the Bahrain International Circuit to begin the 2019 season, EMS Race Team now returns to the United States for the Ferrari Challenge at Circuit of the Americas. The weekend-long racing event at the world-class track in Austin, Texas will be held on March 8-10. Driver James Weiland and his crew from Boardwalk Ferrari/Ferrari of San Francisco will look to build on the momentum from Bahrain while working toward another podium finish at COTA. Along the way, the team will continue racing to raise awareness for PETA Cruelty Free, Coach Sam’s Inner Circle and Cornerstone of Hope by dedicating the trip to those three causes. During last year’s Ferrari Challenge at COTA, EMS Race Team was met with some adversity in the form of engine trouble which contributed to P4 and P9 finishes. In 2017, Weiland and company competed in the Pirelli World Challenge at COTA and secured a victory. Prior to that, EMS earned a pair of victories during the 2016 Ferrari Challenge at Circuit of the Americas which helped propel them to the season championship. This year EMS Race Team hopes to leverage that past success and add another trophy from Austin to the trophy case. For behind-the-scenes coverage of the 2019 Ferrari Challenge at Circuit of the Americas, follow EMS Race Team on Facebook, Twitter and Instagram.